Learn how to remove mold from any household surface! When you’re taking care of something as big as a house, mold will inevitably spring up somewhere. Mold can grow in any type of environment anywhere in the house and can be dangerous or harmless. It’s important to know which is which and how to clean mold when a mold colony is discovered. Some types of mold can be dangerous, but by far the most common type of mold found in households is mildew. Mildew is relatively harmless and is commonly found in warm and damp places like basements and bathrooms. It looks black or brown and kind of resembles soil. If you can smell a distinct musty odor anywhere around your home, you can be pretty sure that there is mold concentration somewhere. Check areas that could be damp and areas that do not get used very often. If you find mold, you will want to get rid of the mold accumulation as soon as possible. Unfortunately, if you’ve found a large section of mold, which we consider as mold covering 10 square feet or larger, it’s time to call a professional. 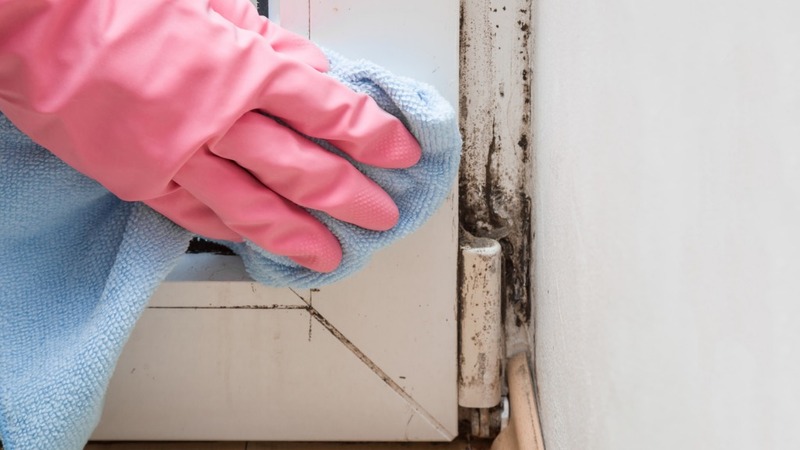 Do not hesitate to learn how to clean mold, because there are dangerous types of mold that could put the very structure of your home in jeopardy. Many molds are toxic and could affect respiratory problems for the inhabitants. Some products help kill mold better than others, and some should only be used in specific situations. We’ll detail exactly what those situations are below. In general, products that help to remove mold are baking soda, borax, white vinegar, hydrogen peroxide, or bleach. Be careful, because some products like bleach are extremely harsh and must be used with caution. Mildew found on fabrics can be easily treated in most cases. First, take the compromised fabric outside to avoid spreading mold spores in your own home. Then, take a brush and brush away as much mold as you can on the surface. If you instead prefer to wash it, use the hottest temperature of water recommended and add a disinfectant into the washing machine. If stains are still present, soak the fabric using a solution of oxygen bleach and water. Mold on the structure of your house is always dangerous so the first step is to check for structural damage while wearing proper safety equipment. If structural damage is present, it’s time to call in a professional. If it is your carpet that is emitting a musty odor, it’s time to get rid of the carpet. Be sure to dispose of it safely to avoid spreading mold spores onto other surfaces. Clean the area thoroughly and allow it to air dry for a few days. To clean mold on other surfaces, mix 1 part detergent into 10 parts bleach and 20 parts water. Use a sponge or mop to apply the solution to the affected areas and let it dry instead of rinsing it off. Mold on the outside of your house can be treated by a chlorine bleach solution. Mix a gallon of water to a cup of bleach and make sure that you cover up any nearby plants and grass with heavy plastic sheets. Wet the molded areas with water before you use the solution, and be sure to wear safety glasses, goggles, and masks and understand that bleach on fabric will result in color loss. Now you’re ready to go – you can use the solution any way you want, be that power washing or hand-scrubbing. Air dry everything. The bathroom is perhaps the most common place mold can settle in, mostly because of the damp environment. If you are treating mold here, you can mix 1 part bleach with 16 parts water and apply directly to the moldy area. Let the solution sit for 15 minutes and then scrub. To treat leather items that have mold growing on them, bring them outside first. Then, use a cloth dipped in white vinegar and clean the surface. Use soap and warm water to clean off the vinegar and dry with a new cloth. This should be good enough to remove the mold from the leather. Discovering mold in your house is serious business. Knowing how to get rid of mold swiftly and efficiently is an extremely valuable household skill. When you act fast and correctly, you can be sure that you’ve completely gotten rid of the mold colony. Whether it’s mildew or something more serious, your house will be in good hands now that you know how to remove mold from any surface. Thanks for reading and we hope that the mold never comes back!